This was my #sierradrive truck…I loved the quick pick up & spunky engine. Early the next morning we gathered our reins and took off on a trail ride through the Sierra West Ranch with our four legged friends. The ride was took us up to the look out and the general store filled with local handmade crafts. Our cowboy did an amazing job getting our horses saddled up. We then took a trail ride with our 2014 Sierra truck around the spectacular ranch that had been our home for the past two days. My thoughts, of course, when right to my family and how much they would enjoy this experience. Sierra West Ranch is definitely on our #GuthrieFamilyAdventure bucket list. We said our goodbyes to the ranchers Ginny & Randy, and picked up several stunning Sierra West Ranch calendars as souvenirs. We headed out towards Calgary, made a quick stop for lunch and to pick up the world’s best beef jerky (according to Jesus Jason! ) for my DH. Our drive back to Calgary gave us glimpes of the devestation the flood had taken on the land & people. We were amazed to see how quickly the infustructure was being rebuilt. We headed back to the Hotel Arts to shower up, fuel up with some Starbucks True North blend and started to ready ourselves for the Grandstand Show at the Calgary Stampede. We met a friend on the way to the Calgary Stampede! The evening began with dinner with the fellow social media folks at the Grandstand. We then took our party to the outdoor grandstand and watched the opening ceremonies. Having never been to the Calgary Stampede, it was much more ceremonial then I anticipated. The chuck wagon races were exhilerating & we found our some interesting facts about the sport due to our resident expert Brent, Stephanie’s husband. All the horses have to wear heart monitors to ensure their safety. Outriders make sure the horses & drivers safe during the entire race. Having three of my own children, I was impressed at the inclusion of children in the children’s only chuckwagon races. The only downside was seeing the children racing made me miss my own little ones. We were able to leave the Grandstand and get up close and personal with the horses and their families. It was obvious, as an observer that the ranchers love & care for their horses. There were hugs & warm baths after the races for the horses win or lose. We explored the midway, food booths, information tents & shopping areas. For all the fashionistas, this is the place to get glamous jeans, belt buckles, cowboy boots & hats. I had hoped to purchase a Hell or High water t-shirt for my Dad, but they had sold out by the time we arrived. So we made a donation to the Red Cross, to make sure can help out the good people effeected by this flood. Later we were in awe of the “circ du soleil-flying piano – caged dancers” Grandstand Show, the likes of I had never experienced before. Having said that, the late night people watching at the Stampede was a very unique expereince as well. We would have loved to spend more time in our room at the Arts Hotel. This was another full day hosted by our GMC Adventure team. We said good-bye to our trucks, our ranch family and experienced the greatest outdoor show on earth. Our beds once again were calling our names, as the #sierradrive shinannigans continued late into the Calgary night. This included an epic corn dog feast, fake money shopping sprees and visits to local late night establishments. Saying goodbye to my truck, see you soon! 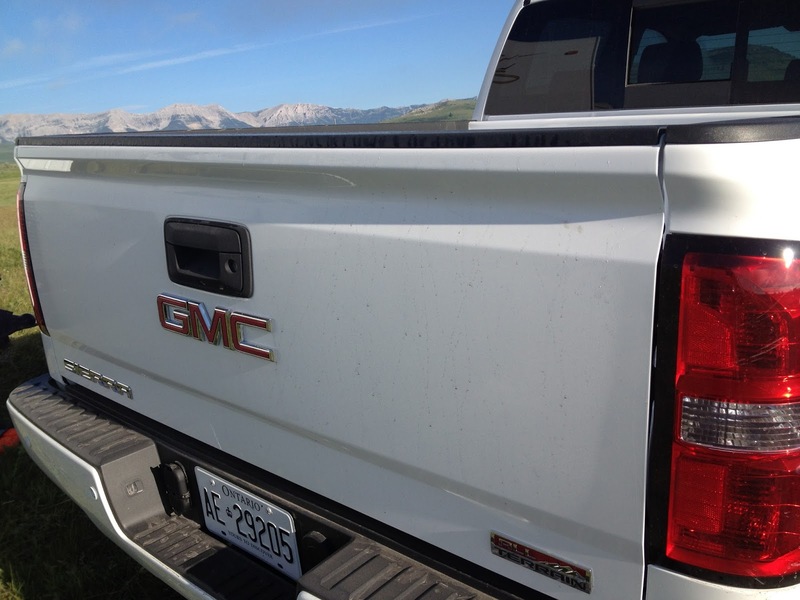 My “Day 3” post will include all the important facts about my truck including a review of our experience, as well as all the technological & comfort features offered by the 2014 Sierra. Yes, I still call it my truck…just hoping it shows up in my driveway someday soon.